An alternative approach in Power BI Desktop to give the same functionality, but more in accordance with the way the software is meant to be used. You can generate the table and stored procedures used for this example here (although it wouldn't take too long to type them in from scratch). 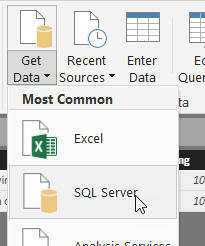 This blog assumes that you're comfortable with the basics of Power BI Desktop and also of SQL stored procedures. If you're not, you might want to consider our Power BI courses or SQL courses. Planet Earth II is a fantastic natural history program from the BBC, if you're wondering. Initially you should see all of the rows in the table. I can easily do this by applying a filter in the Power BI Query Editor, but can it be done by calling a SQL stored procedure and passing a parameter to it? In SSRS you can type in a rating, and pass this to a stored procedure which will show all animals for that rating. 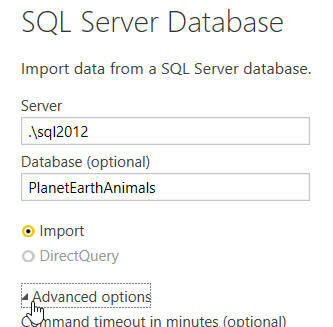 Choose this option to get data from your SQL Server database. Click on Advanced options to type in the SQL you want to run. Your server will obviously be different from the one shown here. 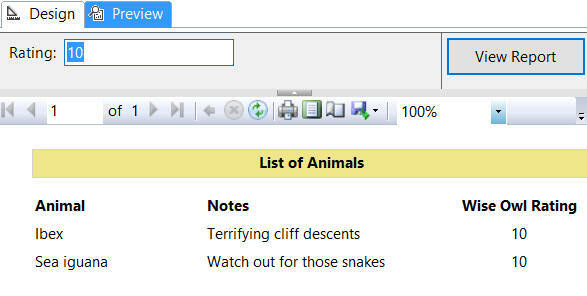 The dynamic SQL to list out the animals with a rating of 10. The query only shows animals with a rating of 10. What we'd REALLY like to do is to pass in the value of a parameter set in Power BI Desktop into the stored procedure, but I can't find any way to do this! Here, I'm sure, is how Microsoft intend the product to be used! Click on a value in the slicer, and the table will update. Alternatively, you could use linked visualisations and set drill-down options, but this is a variation of the same thing. I wholeheartedly agree with your comment "What we'd REALLY like to do is to pass in the value of a parameter set in Power BI Desktop into the stored procedure, but I can't find any way to do this!"... have Microsoft added the ability to do this yet? I can't find a simple way to call SQL Stored Procedures and pass parameters to them. It really doesn't make sense to bring back millions of rows of SQL data into Power BI and then filter the results there to see the couple of hundred records you're insterested in. I cannot find a good online resource for Power BI where this is explained. I've found a few workarounds, but nothing obvious. Is Power BI really unable to fully support Microsoft SQL Server yet? It seems we're both wondering the same thing! Can anyone out there help?